9AM Crotty Hall (UMass) 411-417 N. Pleasant St.
10:30 Hitchcock Center 845 West St.
12:00 Kern Center 893 West St.
2:00 South Congregational 1066 South East St. Parking at Crotty Hall is limited, please use nearby UMass lots. We will walk from the Hitchcock Center to Kern Center which are both on the Hampshire Campus. 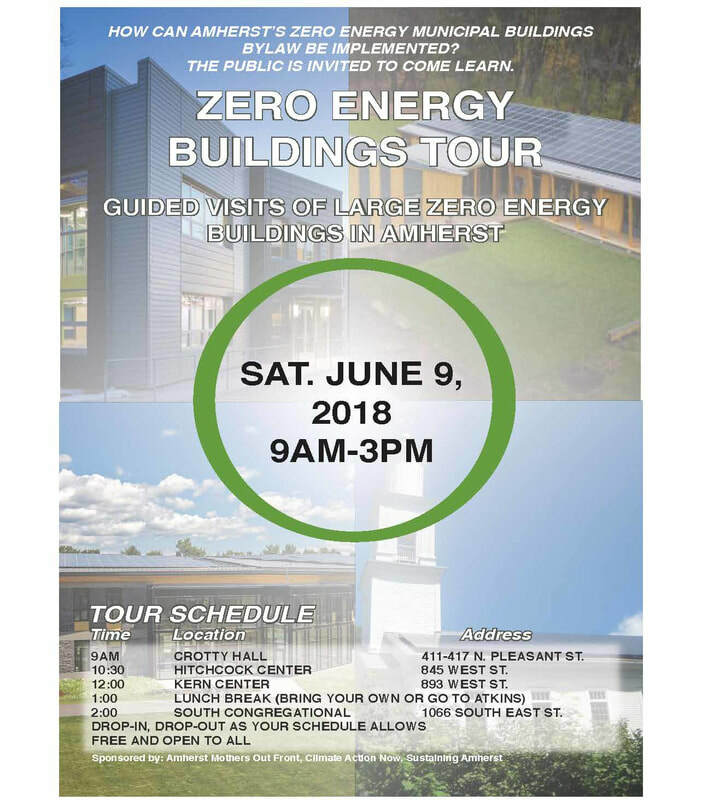 Unitarian Univarsalist Society of amherst, 121 n. pleasant st.
Darren Port, a national expert on municipal and state building policy will present Zero Energy Buildings and Communities: The Landscape of the Future. As the Buildings and Community Solutions Manager at Northeast Energy Efficiency Partnerships (NEEP), Port is paving the way for the proliferation of zero energy buildings throughout the Northeast and Mid-Atlantic region. He brings a broad perspective to the critical role of towns and cities in reducing carbon emissions through building energy performance standards and clean energy development. His presentation will draw connections between Zero Energy buildings, local energy resources,resilience and community-wide energy demand management. Prior to joining NEEP, Port was the Green Building Administrator and Green Code Specialist for the State of New Jersey. Nationally, he serves as an appointed member on building policy making committees. ELLEN WATTS WOWED A CROWD OF MORE THAN 70 PEOPLE WITH HER INFORMATIVE PRESENTATION! THANKS TO ALL WHO ATTENDED. Architect Ellen Watts, president and co-founder of Architerra in Boston, will discuss her firm’s experience with zero energy and energy positive buildings, sharing design strategies and performance data. Remarks will focus on the Commonwealth of Massachusetts Division of Fisheries & Wildlife Field Headquarters in Westborough, MA (2014), and the Clark University Alumni & Student Engagement Center in Worcester, MA (2016). Watts chaired the Massachusetts Governor’s Zero Net Energy Buildings Task Force in 2008-2009, and is a passionate advocate for practical high performance buildings and resilient planning. She holds degrees from Smith, Harvard and MIT. This event is co-sponsored by Mother's Out Front Amherst, Climate Action Now, Sustaining Amherst, League of Women Voter's and the Hitchcock Center for the Environment. On November 8, 2017 Amherst Town Meeting voted 123 to 54 to become the first municipality in the nation to mandate that all new municipal buildings and additions costing over one million dollars be “Zero Energy.” Zero Energy, or Net Zero, buildings produce as much energy as they use over the course of a year. Zero Energy buildings are highly energy efficient with renewable power generation. The same night, Town Meeting also voted unanimously in support of the 100% Renewable Energy Resolution. Our group is expanding and evolving beyond the work of passing the bylaw to working with the Town, its committees, Zero Energy consultants, and funding sources to make sure that the much needed new town buildings will be built. ​​Get in touch if you are interested in helping with the next step. Click here to see the slides we presented to the Select Board. Forty Town Meeting members signed a letter of support to the Select Board before they met to review the Warrant Article. Click here for a link to the site where you can read the letter. Zero energy buildings are energy efficient buildings that produce enough on-site renewable energy to meet its own annual energy consumption requirements. Amherst is already home to several zero energy buildings including the Hitchcock Center. •We are at risk of pushing our climate system toward abrupt, unpredictable and potentially irreversible changes with highly damaging impacts. •The sooner we act the lower the risk. Independent of its profound value to the planet and to our descendants, a zero-energy building is also extremely cost-effective. Why? In construction, extra money spent for more space, nicer finishes, extra cabinetry, more landscaping or other such things, is just extra cost. The price goes up, you borrow more money to pay for it, and you have to pay that money back, with interest. Deciding to spend more on energy conservation and renewable energy isn’t like that. Yes, the price goes up, and yes, you borrow more money. But most of the debt service for that borrowing is balanced by the value of the energy saved each year by the extra energy conservation measures, and by the value of the energy generated each year by renewables. After the loan is paid off, there is a big bonus. Then, and for decades thereafter, it takes very little money to supply the building with energy. It should be a very easy decision. See the graphs below for how the economics work. The blue above shows the debt and interest for the ZE cost (10% additional cost) for a generic 10 million dollar building. The orange shows the energy costs which increase with inflation. The graph above shows the difference in cost between the ZE building and the generic building. When the cost of the energy that is saved is deducted from the extra money spent to build the building to a ZE standard, we see that the building is revenue POSITIVE after 16 years.